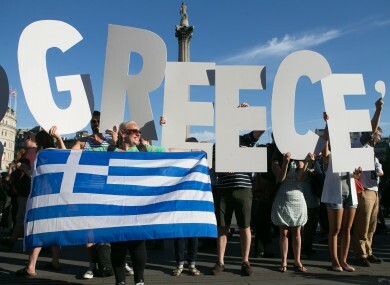 EARLIER TODAY CAME the news that Greece had secured a third bailout worth up to €86 billion over the next three years. The country’s anti-austerity government agreed tough reforms as European Council president Donald Tusk confirmed a “unanimous” agreement on a new deal for the cash-strapped economy. Greek Prime Minister Alexis Tsipras said the deal was good for his country despite its harsh terms being nearly identical to those rejected in a referendum just over a week ago. “We fought a righteous battle to the end,” he said after 17 hours of talks. However Tsipras has only two days to rush the changes through its parliament, where he will have to sell the pension and labour reforms, VAT hikes and privatisation to members of his left-wing Syriza party. This evening, the White House hailed the news, describing the deal as a “credible step”. But Josh Earnest, President Barack Obama’s spokesman, cautioned that difficult work remained and there were “still important decisions and important steps to be taken” to prevent Athens from falling into the economic abyss. Banks are expected to remain closed for another two days even though a deal was reached. As part of the deal, a €50 billion fund made up of Greek public assets earmarked for sale will be set up. That pool will then be put under the control of EU creditors and the money used to prop up Greece’s failing banks, as well as to pay down the country’s debts. Eurogroup President Dutch Finance Minister Jeroen Dijsselbloem said the new deal would put Greece “back on track”. He said that half the money in the fund would be used to pay down debt and the remainder would be invested in Greece. European Commission President Jean-Claude Juncker said negotiating the agreement had been “laborious” but the work had now been concluded. He said the EU Commission repeated time and time again that it would not accept a “Grexit”. Juncker added that the commission was satisfied a result had been found. Above all, he said that Greece needed growth and it needed jobs. Tsipras said he believed the new programme will bring growth to Greece and he had averted an EU plan for the “choking of the Greek economy”. He said he took responsibility for the deal and that he managed to reach compromise on some of Europe’s more extreme proposals. German Chancellor Angela Merkel, whose country had been pushing for harsh austerity measures, said she was convinced the deal could work but success was not guaranteed. The road will be long, and judging by the negotiations tonight, difficult,” she said. Merkel said the Greek people wanted to remain in the EU family. The German chancellor said the “trust fund” of Greek assets was also about help, adding that it was important to strengthen the government through modernisation. She said this deal was “completely in line” with other programmes that have been agreed in the past, such as the one struck with Ireland. The leaders of Greece, Germany, France and the EU had proposed a “compromise” on a bailout deal for Athens at the late-night talks last night. They hammered out the proposal on the sidelines of an emergency summit of the 19 countries that use the euro. Greece leaving the eurozone would be a disaster both for the debt-laden country and the single currency, France’s prime minister warned this morning. Additional reporting Christina Finn, Aoife Barry and AFP. Email “Tsipras has two days to convince his parliament about third bailout”. Feedback on “Tsipras has two days to convince his parliament about third bailout”.